CEBU CITY - As a Christmas treat to Cebu boxing fans, some of the hottest prospects of dynamic boxing outlet Omega Gym will see action this coming Saturday (Dec 22) at Robinsons Galleria Cebu, an exciting afternoon show that no boxing fan here in Cebu can afford to miss. In the main event, world-ranked Omega fighter Christian Araneta - candidate to Cebu's Best Knock Out of the Year - wages war against "The Lizard" Vincent Bautista, 25, of Tarlac in an eight-chapter Jumanji war in the Light Flyweight division. In his last fight last August, Araneta (16-0, 14 KO's) scored a devastating, explosive 12th round knock out over game Jerry Tomogdan, sending Jerry flying backwards, landing unconscious flat on his back, shocking and scaring everyone in attendance that night at the Mandaue Sports Complex. Christian Araneta drops Jerry Tomogdan unconscious. Christian hammered home that chilling knockout two seconds before the end of the battle, at the 2:58 mark in round 12. How about that? Will the Lizard Bautista be brutally squashed the same way? Or will it be the Lizard the one to eat Araneta badly? 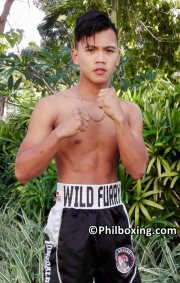 Christian Araneta, 23, is currently rated in the light flyweight world-rankings as WBC #10, WBA #9 and WBO #11. 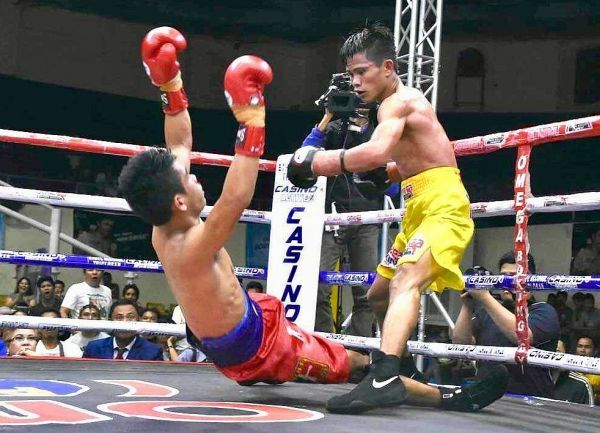 In the co-feature, southpaw Ponciano "Ponce" Remandiman (8-4-1, 4 KO's) of the beautiful island province of Leyte battles tough-and-focused Vicente "Enting" Casido (6-1-1, 2 KO's) of the The City of Gentle People, Dumaguete, Negros Oriental. The well-trained Ponce Remandiman comes from scoring wins in his last six rumbles and wants to end the year with a thrilling knock out victory. Will he be able to score a stoppage win? Or will he be the one stopped? Lets find out because Enting Casido is no push-over. Their coming war is an eight-rounder in the bantamweight division. In addition, the "Hammer" Harmonito Dela Torre (19-2, 12 KO's) of the City of Golden Friendship, Cagayan de Oro, aims at bouncing back from tough defeats in Las Vegas and Malaysia by taking on experienced 43-fight-veteran Richard "Tibay" Betos (20-21-2, 7 KO's) from The Home of the Balangays, Butuan. Boxing fans feel that Dela Torre desperately needs a win, if he wants to keep his boxing career afloat, and wonder how is Harmonito's confidence. Better be good because Betos is here to fight, with nothing to lose and much to win. Indeed, even though the best fighting days of Tibay Betos might be over, the 31 year old former interim WBC Asian champ still knows a trick or two. Will Harmonito rack-up an impressive win? Or will old warrior Betos rock Harmonito to score Cebu's most shocking result of the year? You have to be there to find out. Furthermore, promising 17 year-old debutant "Wild Fury" Bryan James Wild of the Wild Boxing Stable fights as pro boxer for the first time against more-experienced Wilbert Rota in a four-rounder clash in the tough 126-pound t division. Will Bryan James Wild be enough wild in the ring to dominate Wilbert Rota to score his first triumph as a pro fighter? You have to be there to know. Also in the 126-pound weight class, undefeated 19 year-old 130-pounder Carlo Bacaro (2-0, 2 KO's) of Cebu squares off Mark Anthony Rotilles (2-3, 1 KO) of Bohol. Their 4-rounder action tiff promises total action. According to the card's matchmaker, the winner of the Bacaro-Rotiles fight will challenge the winner of the Wild-Rota rumble. The card this Saturday (Dec 22) at Robinsons Galleria is sanctioned by the Games and Amusement Board (GAB) Cebu Regional Extension Office headed by Arlene M. Olondriz with the assistance of the experience men of boxing Rolando "Lando" Mendoza and GAB Inspector Glenn Sonido Agena. #Kumbati at the Mall is a production of Omega Pro Sports International and Omega Boxing Gym in association with Robinsons Galleria Cebu and the support of Efficascent Oil, Casino Alcohol, Bioderm Soap, Omega Pain Killer and Magic Cebu 92.3 FM. Fights start at 4 PM. The author Carlos Costa is a boxing reporter based in Cebu City. Carlos can be reached by email: Carlos512@hotmail.com and Whatsapp: +639184538152.